For innumerable centuries aboriginal people have walked this country to engage in ceremonies at important sites, using traditional paths with water sources that they carefully managed. One hundred and fifty years ago, Charles Hunt was charged with clearing a track east from York to potential pastoral and agricultural land north of Kalgoorlie, and sinking wells at intervals that would allow others to follow. 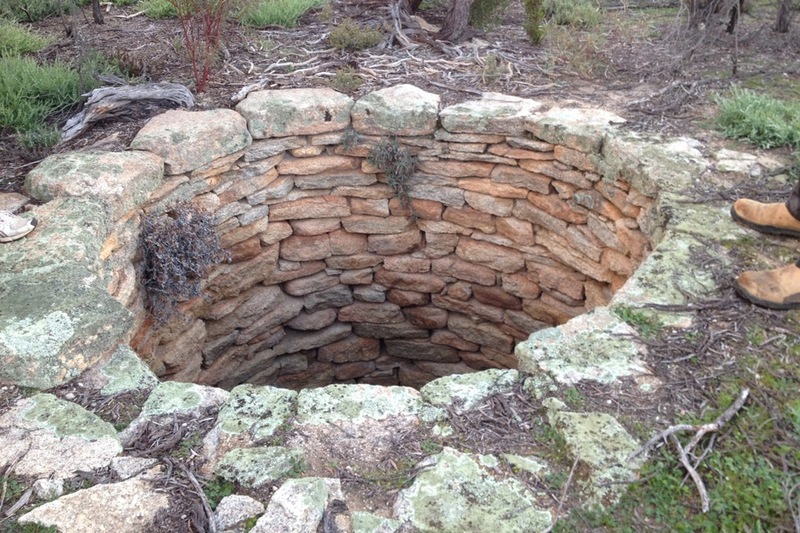 With the assistance of aboriginal guides and a small party of workers he developed a series of stone-lined wells for 500 kilometres from York to Lake Lefroy. Although the track is named after Hunt as leader of the expedition, the knowledge of the country and existing water sources that his aboriginal guide provided prevented the party from perishing in the harsh country. When gold was discovered, Hunt’s Track became a well-trodden way. Where subsequent settlement has not obliterated it, this track still exists today. In September each year, Koora Retreat offers a two-week opportunity to walk this track from Yellowdine to Gnarlbine Rock, in 20 km sections, some require remote back-packing and some sections are suitable to moderate walking ability. Koora Retreat offers a pamphlet for making a personal walk along a section of Hunt’s Track between the retreat centre and the original indigenous rock well. Contact Koora Retreat to register your interest for this walk.